Noritake company established in 1904. However, the opening is the Edo era. Ichizaemon Morimura he ran harness shop was concerned about that Japanese gold flowed out of country while various culture flowed in from Europe and America. In 1858, He noticed Japan suffers a loss because of bad exchage rate. And also he had seen situations that Japanese gold and silver were bought cheaply and flowed out into the foreign territory. So he talked with Yukichi Fukuzawa and got advice that it’s better to earn foreign currency by export trade to get back gold flowed out into the foreign territory. Depends on this suggestion Ichizaemon Morimura made up his mind to do export trade. It was just the time the long policy of seclusion finished, and people felt the foreign countries were very far. In 1876, Ichizaemon Morimura established group of Morimura and dispatched a younger brother Toyo Morimura in New York. He opened the shop at 238 6street NY and sold china,japan,inrou,byoubu,kakejiku and sensu that was from Japan. Those goods were so popular, the american customer waited for them to arrive from Japan. At first he worked alone hardly, Magobe Okura, Kazuchika Okura, Yasukata Murai,Jitsuei Hirose they sympathized him and participated group of Morimura one after the other. In America china was popular. Morimuras thought it would be promising articles and they decided to produce and sell it. The ceramics which I exported were Japanese-style designs in those days, to extend business, tableware to use every day that was necessary to do a Western-style picture painting to white porcelain. And also they were impressed white china (they saw it in Expo Pris) and dispatched engineer to the Europe to improve on porcelain to pure white. In 1904, they established Nippon Toki unlimited partnership (Nippon Toki Kaisha: previous Noritake Company) at Noritake-town, Nagoya-city. 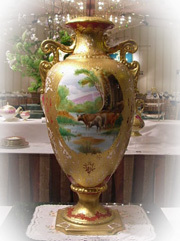 It was beginning for modern ceramic industry in Japan. 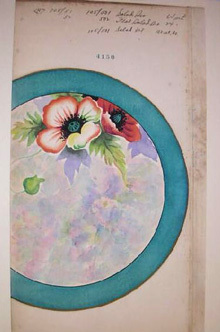 They could make white porcelain, but it was difficult to produce a 25cm-dinner plate. The big plate had been produced, but to produce the plate where bottom was flat was most difficult task. The form of Japanese tableware is different one by one. That’s engaging. On the contrary all the Western tableware is the same form. So they tried to produce it and spend a lot of days. One day, the employee who came to a deadlock had broken the a sample plate(It was form France). 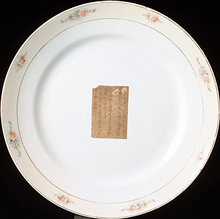 When he watched the broken section he noticed that the center part of the plate was thick. It was a reason they couldn’t make the flat plate. In 1914, first dinnerware was completed in Japan. Now we can see the first dinnerware “sedan” in Noritake Museum. Early Noritake, we cannot limit the generation clearly, is ornaments(a vase, a pot, a ceramics doll ・・・)and dinnerware which were exported to U.S.A. by group of Morimura and Nippon Toki unlimited partnership from the end of 1800's to World War�U. Those products are popular collector's items that receive high acclaim as an artistic production, and are called Early Noritake from an antique lover now. Those Early Noritake is classified into roughly two. 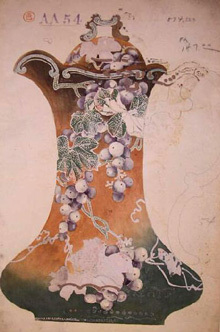 The early work until 1910's strongly receives influence of popular art nouveau in those days. An initial work was a vase and a candy box, etc. however coffeepots etc. came to be produced gradually. And in 1914, first their dinner set in Japan was completed. At that time, most commodities are exports to the United States and Europe, After a while, the commodity of the Europe and America style came to be sold to Imperial Household Ministry, Department of the Navy in Japan and some restaurants. 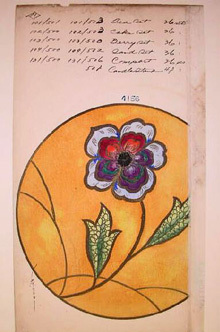 These products were the highest class grades and the design was peculiar, that the technique of the flower and bird picture of Japan and the design of Europe and America united. From end of Taishou era(about 1922) to beginning of Syowa era(about 1929), not a high-level adornment till then but the fancy wear that was able to mass-produce with machine was produced. These are very popular as a very valuable collector's item among the Early Noritake Lovers. Copyright © 2016 ノリタケ 大倉陶園の食器とギフト. All right reserved.